Location: Reguengos de Monsaraz, Alentejo. Grid Reference: 38.45 N 7.37 W.
There are several worthwhile megaliths surrounding the peak of Monsaraz; or 'Mont-Xarez', which dominates the otherwise flat landscape in every direction. 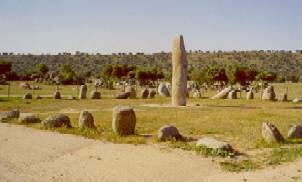 As well as possessing some of Portugal's largest menhirs, the Xarez stone-circle is second only in grandeur to Almendres, near Evora. Over 130 sites have been recorded in the surrounding countryside (1), but some have been re-located due to the massive dam that was built in 2002. Several interesting sites are now under water including the small quaint village of Luz with its Roman ruined fort. 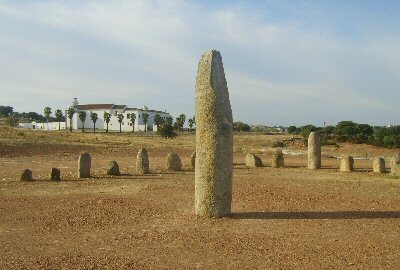 The Xerez (Xarez) menhir / Stone-circle (quadrangle): Originally 5 km south of Monsaraz, the reconstitution of the Xarez stone-circle beside the Convento do Orada was only possible after some research since the original monoliths had been spread apart by agricultural works. Today we are greeted with around 50 medium-sized rounded stones in an approximate square formation, centred with a 4m+ high, 7-ton menhir. The site plaque states that: 'The Whole group had been artificially put together in the 20th century, resulting from the collection and arrangement of small monoliths and manual grindstones around the great menhir, which is 4m high'. 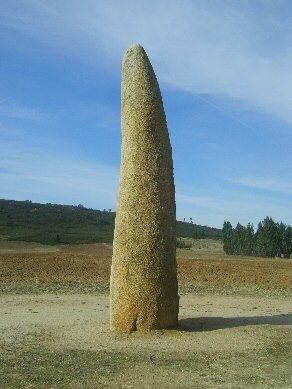 The research by Dr. Pires Gonçalves in the 1970's concluded that the monument was probably erected between 4,000 BC and 3,000 BC and that its original design had been quadrangular, consisting of 55 menhirs between 1.2 - 1.5 metres high. 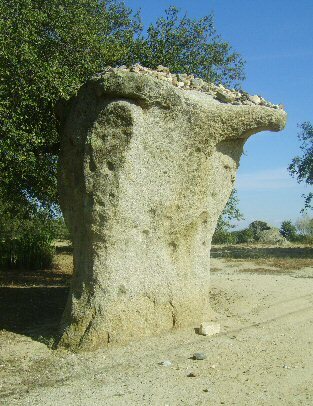 The stones are described as being both phallic and rounded as at Almendres. It took Gonçalves until 1972 to complete the reconstruction. The 'Xarez' monument - before it was relocated. Shortly after the reconstruction, several small granite menhirs were found 300m north, all engraved on their bases (4). They were Classified with IIP as (Dec. nº 1/86, DR 2 de 03 Janeiro 1986)(5). Rectangular Enclosures and their Latitudes. There is a stone-quadrangle at Carnac, which has the peculiar property of having the same angle between diagonal corners as its latitude - a property also shared by the 'Station-stones' at Stonehenge. It should also be remembered in relation to this, that Stonehenge and Almendres were both located at particularly significant lunar Latitudes (Both being positioned under the latitude of the moons extreme azimuths). The azimuth of 100° between Almendres and Xarez cromeleques has also been tentatively suggested as having been related to the azimuth of the full spring moon (3). Of interest is the fact that the spectacular Anta Grande da Zambujeiro also sits along the same proposed 50km 'alignment', although none of the sites are inter-visible. The same alignment continues eastwards towards Lisbon. An alignment from Almendres to the original location of the Xarez monument (through Zambujeiro) produces an approximate azimuth of 110°, while an alignment to Monsaraz is much closer to the expected 100° (+/- 104°). It should be noted that the Xarez rectangle consists of 55 stones (55.8 = 3 x 18.6), three full lunar cycles. 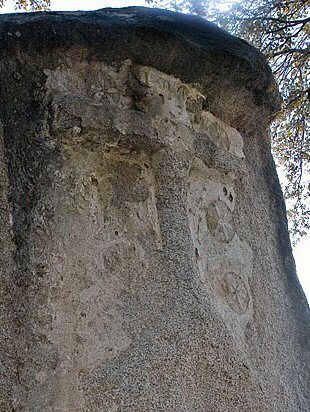 There are several other menhirs in the region of Monsaraz, with further suggestions of astronomy through the engravings and the alignments formed between them. 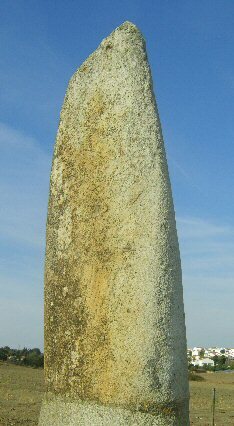 Menhir Bulhão/Belhoa: This menhir was identified in 1970, when it was found fallen and 'broken' according to the site plaque. 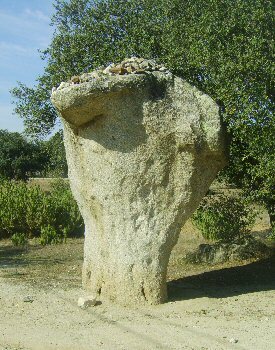 According to Evans & Mohammadi (2), when the menhir was first found, it is said that the local farmers 'chopped' off a third of it to make an olive press'. Whatever, the truth, today, the original top section rests on a modern granite reconstruction. (If it was found 'broken', one wonders where the other original part/s are today?). The menhir is suggested to have been erected as early as the 5th or 6th millennia BC (Ref: Site plaque), which would make it the earliest monument in the region. There are several prominent engravings still just visible on the upper-half of the menhir including a 'sun' shaped symbol, several 'crook's', and 'serpentine-wavy' lines), familiar only in style to the engravings inside Gavr'inis passage-mound in France, similarly dated at around 4,500 BC). The peak of Monsaraz lies exactly 180° to the South, although the natural orientation of the stone follows the proposed 100° azimuth of the spring moon. The general tapering end and 'fin-like' profile reasonably preclude it from having had any association to phallus. 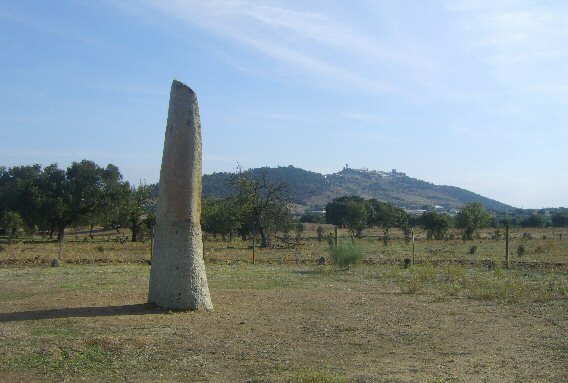 About 3km (2 miles) north of Monsaraz, is the tallest (5.6m/18ft), menhir in the region, and second only in size to the Menir Meada, near Castelo de Vide in all Iberia. The stone weighs around 8 tons and was beautifully shaped and erected to lead an apparently solitary life in the flatlands, with Monsaraz alone looming in the background. There is a slight depression along the top which has led to the common assumption that it was originally phallic by design. There is a noticeable difference between the patina on the exposed face of the rock compared to the pale-sandy colour of the buried face, due to the fact that it remained prostrate for so long. The 'Roche das Namorados' is actually a natural granite outcrop. It is occasionally referred to as 'mushroom-shaped' or 'Uterus' shaped, but its shape varies depending on where one stands. The stone has several large 'dimples' or 'cup-marks' on it, a common feature on Neolithic remains, although there is no way of proving their origin or meaning. Local tradition has given the stone a certain 'pathos'. It is said that if a woman stands with her back to it and throws stones onto it, the number of attempts represents how many years it will be until she gets married. The stone has been 'Christianised' signifying its importance. 2). David J. J. Evans, Kamin Mohammadi, Portugal: the Algarve, 2000, Cadogan guides.